Rookies event 1, a vanishing trend? I am finding it hard to get the numbers to run this event, this is a first. But it has got me wondering about the format of having a single division. Perhaps it gets run in say 3 divisions: U1600, U1300 and ‘U1400 and under 14’. On a brighter note, we start the Autumn Rapid tonight at the club, 6 rounds of 25’+5″ chess, 2 games a night for three consecutive Tuesdays. This is free for members (visitors pay $5 per night). Update 05/03: A great day was had by all 24 players and supporters. Full commentary, results and pictures are here. Where are those Rookies boys? Just 2 weeks now to the 1st Rookies Shield for 2012 (4th Mar) , and so far only girls have been registered. When I say only girls, I think it is great we have females entering. If we have enough ladies, then we can run a separate division. But come on boys – get going and register now! The Waikato-Tainui Games was on this weekend (well, this is the last of 3 weekend events) in a big way outside Taupiri, at the Hopuhopu Sports and Tribal Complex. A lot of sports are being played. Chess was represented from 14 Maraes, playing a 6-round G15/0 tournament. Most of the players had not used clocks before and so this introduced more stress for them than usual. But overall the experience was a good one for the mix of adults and juniors (with two ladies playing). The venue was very good with plenty of space and the air conditioning was much appreciated as summer seems to have arrived at last. Once the event was over, and for a bit of fun, I played a simul against any takers. Cross table and some pictures are below. And a big thank you to Don Turner and his family for letting me get involved and helping out on the day. We start on club nights with a blitz tournament (21st Feb) followed by 3 nights of the Autumn Rapid. Then I am very excited about the start (on 27 Mar) of the club championship and reserves events. The club championship will be a 10 player 90/30 round robin that is FIDE and NZCF rated. The club reserves will be a 9 round 60/10 swiss event. More details to follow. The first weekend event is the ever popular Rookies Shield is back again this year, 3 events spread through the year, with the first event on 4 Mar. This is for those new to chess, chess tournaments, and is limited to players under an NZCF rating of 1600. We hope to have separate girls only divisions this year, numbers allowing. So please register now to kick off a great Rookies season. 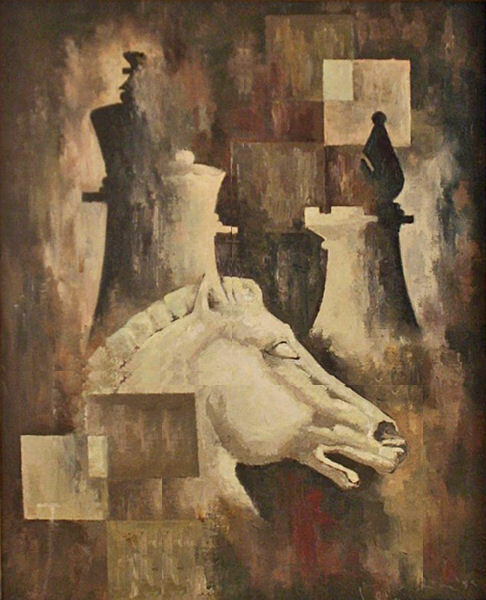 I was just made aware of this you tube link to about 400 paintings where chess is shown in some fashion. Interesting to see how it has changed through the years. Quite a few women playing as well, and most of them are clothed and looking serious about it. Just two examples are posted here. And while I have your attention, just a reminder that the club is up and going for this year as usual, from 5.45pm Tuesdays for chess coaching and from 7pm for regular club night. This Tuesday we are planning the year’s activities, so stay tuned for a refreshed calendar of events.